We’re always striving to provide the best to our riders, from providing the best cycling routes in the nation to helping our riders find product to make their experience the best it can be. GFNCS is committed to quality, and Swiftwick is a perfect match. 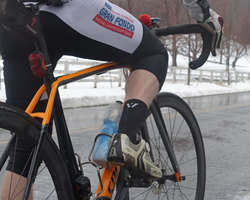 Swiftwick is continuing to show their commitment to cycling sports by signing on as a national sponsor of the Gran Fondo National Championship Series® (GFNCS), the country’s only national race/ride circuit, for the entire 2016 series. Swiftwick socks are designed by athletes for athletes and manufactured entirely in the United States. Launched in 2008, Swiftwick has been a long-time favorite of riders in every category of amateur and professional cycling. With the national GFNCS sponsorship agreement, Swiftwick recognizes and embraces the growing sport of gran fondo riding. Every GFNCS event offers courses covering 30, 60 and 100-mile journeys through some of the most beautiful and challenging terrain in endurance sports. Timed sections allow riders to compete in specific segments of the course and best overall time, while casual cyclists can ride at their own pace. Participants can ride as an individual or a team. GFNCS awards special prizes to the top riders in every age and gender category. Since 2008, Swiftwick has aimed to fuel any adventure with the best socks designed by athletes for athletes. By fusing personal experience with the most advanced fibers, Swiftwick’s superior socks will propel performance so athletes can continue to “do what moves them.” Swiftwick is headquartered in Brentwood, Tenn. Learn more at http://www.swiftwick.com. The Gran Fondo National Championship Series® was established in 2012 and is comprised of seven European-style ride/races staged in the United States. The series is sponsored nationally by Giordana Cycling, Bertucci Performance Watches, Bicycling Magazine, Hammer Nutrition, Swiftwick, SeaSucker Vacuum Mount Bike Racks, Peaks Coaching Group, Feedback Sports, Rudy Project, ProGold Cycling, Jittery Joe’s Coffee, Polar Bottle, Ritchey Bicycle Components, and Capua Law Firm. Founder and President Reuben Kline has more than 25 years of experience in the bicycle industry, including five years as a professional mountain biker, ten years as a full-time race director and 20 years as promoter of the Michaux Endurance Series. The company is headquartered in the Washington, D.C. area. For more information visit http://www.gfncs.com.